What a transformation, Bhajans bring about bodily, mentally and spiritually! "Prashanthi Bhajans" is indeed unique in this respect and has come to be renowned as such, viz., Prashanthi Bhajans. A true Prashanthi style Bhajan has come to represent certain excellence of discipline, devotion and dedication. More than the mere leading and repeating of the Bhajans, the orderly seating and sitting of Gents and Ladies separately in rows, one behind the other, with closed eyes and clapping hands, with tongues and lips engaged on following the Bhajans and with minds concentrated on the Lord, is something unique. This results in 'Ananda', a spiritual elevation. No wonder, Prashanthi Bhajans is not only an introduction to the spiritual up-liftment, but it helps in the spiritual realisation itself. Prashanthi style Bhajans has indeed been Swami's most prized Gift to humanity. 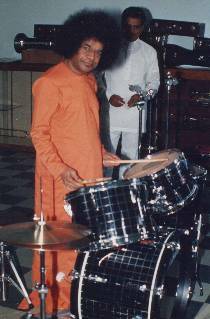 Swami's Bhajan is a beautiful and effective means of developing discipline, peace and love. The Bhajans, so subtly and continuously influence the attitudes, behaviour and lives of the participant, that it results not only in bringing about a spiritual transformation of men and women but surely leads to the realization of supreme experience. As we develop supreme devotion through Bhajans, very often we go into a state of contemplation too, and our lives are enriched constantly. The palms of our hands are reverently brought together in prayer for His Grace and Protection. Our heads are bent in humble contemplation. Our bodies are thrilled by fervour of devotion, at times indicated by the hair standing on end. Our voice is choked with feelings of deep devotion and our eyes well up with tears of joy. The constant repetition of 'names of the Lord create vibrations all over. We do not require any "Gnana" knowledge or wisdom. Only sincere devotion will lead you to the highest level of spirituality. We should get always engaged ourselves in chanting the names of the Lord. The holy names acquire power when repeated with utmost devotion. The holy name will cut off everything hostile in our way. We should develop a total faith in the name of the Lord. It will rescue one from Samsaara. It helps us in the attainment of complete freedom and mastery. Ultimately the constant chanting of sacred names of Lord, enable us to reach the fruition of our Life. 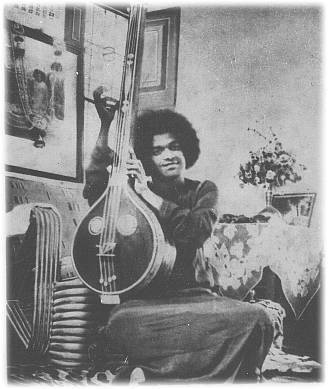 When we are very intense in our devotion, Swami provides evidence of His Grace and acknowledges in His own subtle ways, and encourage us in our efforts. In the previous installment, I had mentioned about my friend Dr. Balakrishnan, who is also popularly known as 'Saipremi'. He is a great singer, both Carnatic classical, Bhajans, an expert in recitation of Vedas, etc. Though an engineer by profession, (since retired), he took it upon himself to study and graduate in Homeopathic medicines, and is now offering free services, to the poor and needy, by providing free consultations and medicines. Wherever there special Bhajan sessions, He will be invited to organised one and lead the same. Both of us were associated in preparing and presenting over 100 episodes of Sai Bhajans in the Satellite network (Raj TV), which ran for more than 2 years in the network, and had attracted millions of viewers for this popular program. I had been a witness to many miracles happening while he was singing Bhajans. Yes, it was in the residence of a devotee, at Anna Nagar, Madras, while he was singing, vibhoothi was flowing from various pictures profusely. There were small pieces of sugar candy too. At the end of the Bhajans, a Siva Lingam had also appeared in the flowers offered at the Lotus Feet. The monthly Bhajans used to be a big occasion in our house. No doubt, Mr. Balakrishnan and his team would always be present. On one such occasion, apparently he turned emotional while singing the 'Laali' (Lullaby songs sung at the end of Bhajan sessions). The 'Laali' that day was very elaborate, rendered in different ragas. We were thrilled to witness the bunch of flowers kept at the top of a picture of Bhagavan, raising up and down, keeping in tune and pace with the tala. As soon as the song was over, the flower would rest at its place. Everybody who participated in the Bhajan witnessed this great miracle. According to various saints and seers, in this Kali Yuga, Nama Smarana is the best and smooth method of attaining salvation. Singing the names and glory of the Lord, with devotion, dedication and discipline, purifies the mind of the devotee. How soulfully Swami renders the Bhajan, "Bhajana Bina Sukha Shanthi Nahin..". (There is no peace or sukh i.e. real happiness in life, without Nama Sankeertan). With Lords names constantly on the lips, one is bound to reach nearer and nearer to Him. The very process of getting proximity to Him, is a process of imbibing all the divine qualities. Bhajans mechanically and routinely rendered, do not reach Bhagavan. It is Bhajan with the Bhava or devotion which carries us to Bhagavan. "If we switch on the tape recorder, it will also start singing", says Swami. When we sing the name of the Lord, our mind should dwell only on the thoughts of the Lord. Bhava should be developed along with rage and tala. It is only then we are, in a real sense, involved in Bhajan. We will be able to derive unalloyed joy, overcoming the opposing dual experiences like pain and pleasure. The sole purpose of devotion is to pray, (1) for the Lord to be ever in the abode of our heart (Hrudaya Nivasi), and (2) for leading us to contemplate on the Lord in all states of our existence. Basically, all of us are supremely good. And yet, we find ourselves whirling in the ocean of Samsaara with the duality of experiences of happiness and sorrow. All our knowledge and wisdom would be mere dry bones without the elevating grip of Bhakthi. Nama Smarana is the easiest and best expression of Bhakthi. It is Bhakthi through Bhajans which rescues us from the travails of the life and takes us proximate to the Lord. Swami has given us assurance that, "Wherever My Name is sung, I manifest myself!" We should have hundred percent faith and confidence in this assurance when take up our seat in Bhajan sessions, and participate with deep devotion. Bhajan is seeing God though sound i.e. realizing the Naada Brahma! "Let your whole life be Bhajan" - says Baba. Bhajan in a wider sense includes Nama Japa( repeating Lords name several times), Nama Smarana ( Remembering his name), Nama Dhyana ( Meditating in silence), Nama Archana( Worshipping 108 times or 1008 times His various glorified names). Whatever be the method one follows, the devotee attains a "peak" at certain moments, forgetting the body and the surroundings. Such transcendental experiences are possible for even very ordinary devotees, when they happen to be in a Satsang (congregation of good souls), or in the company of a great soul who experiences such an ecstasy. When one discusses about bhajan's, who can forget about MEERA? She is the embodiment of prema to SRI KRISHNA. Meera bhajans are simple and sweet outpourings of her love to her Lord. Once I asked Baba " What is Bliss? ". His short reply was " Being and Becoming" . I used to ponder over this. It is difficult to explain, but to experience this is very easy. Meera had that experience very often. When I think of Meera, my mind flows to a living Legend. She is popularly known as "M.S". Smt M.S. Subbalakshmi is the queen music and is popular all over the world. She has acted the role of Meera in the film ' Bhakta Meera'. Name and fame, awards and rewards vied with each other to decorate this nightingale. Our Lord called her 'Living Meera'. Both M.S. and her Late husband Sri. Sadasivam, a great freedom fighter and a man of sterling qualities, had been to Prashanthi Nilayam often. I was fortunate enough to visit her house. Baba, during one of His visits, gave his slippers to her for worship. Swami used to wear sandals in those days. The sandals were not made of gold or silver but of ordinary type. M.S. used to do Nama Archana 108 times with great faith and feelings. M.S used to merge with divinity whenever and wherever she sings. This ' Being and Becoming' experience is do infectious that her audiences were also made to feel this divinity. This SWANUBHAVAM (self enjoying) is very important for any bhajan singer. To continue about M.S, I can quote one more incident. My friend Bombay Srinivasan was successful in prevailing upon M.S to light the Kuthu Vilakku (auspicious lamp) to inaugurate our Centre Anniversary. She later even volunteered to sing some Bhajans. To give sruthi, one old, not-so-good, air leaking harmonium only was available. Yet she sang in her melodious voice, a few bhajans, without any fuss. Let us imbibe her humility, devotion and dedication whenever we chant bhakti Geeth (devotional singing).